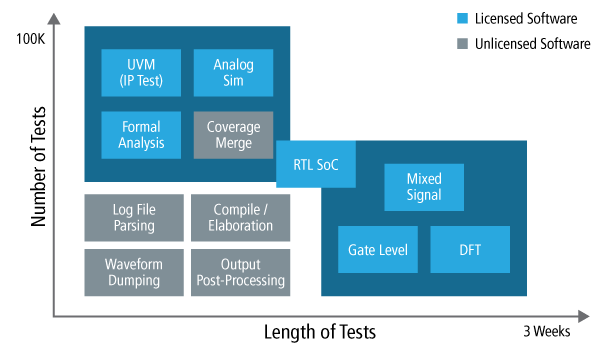 Verifying that system-on-chip (SoC) designs function correctly prior to manufacturing is a massive task requiring high-performance computing (HPC). Engineers have multiple means to address this problem because verifying every state isn’t reasonable, but the most pervasive technology underlying these approaches is logic simulation. Accounting for over 70% of the EDA compute workload, SoC verification is a key driver for growth and transformation of the datacenter. Datacenters need compute-dense platforms optimized for improved performance for a variety of different workloads that can be deployed and managed as cost effectively as possible. Datacenters that include Arm®-based servers can leverage tens of thousands of multi-core CPUs to execute massive numbers of HPC workloads, such as those needed to verify SoCs for mobile, IoT, cloud, 5G, and other applications. Cadence has been working with Arm, HPE, Marvell, and others to solve the compute needs of SoC verification on Arm-based server datacenters. Verification jobs generally fall into two classes. The first is short tests that are used to verify IP blocks. These tend to run easily on one core and address a fraction of the server memory, which means each core in a server can run one of the jobs and get high throughput. The other class is huge jobs that run for hours to weeks and take most or all of the memory on a server. For these jobs, they either run on a single core and consume the entire memory of the server or, with Cadence® Xcelium™ multi-core simulation, the job can be distributed across multiple cores so it runs faster. Beyond that, there are many other verification workloads that are unlicensed or not license limited including compile/elaboration, coverage merging, output post-processing and more. Each of these also require compute capacity in the datacenter. A comprehensive verification suite running natively on Arm-based servers further extends the computational benefits by more efficiently executing both high-throughput and high-capacity workloads to reduce overall SoC verification time and costs. By porting EDA tools to Arm-based servers, Cadence is providing the electronics industry with the tooling that can exploit innovative HPC servers to speed the verification of their SoCs.